Explore the Cyclades on a 9 day-luxury cruise aboard the Sea Cloud: Lindblad, an exclusive charter of the historic windjammer Sea Cloud. These are the Greek islands of the imagination, where colorful fishing boats are reflected in azure waters and whitewashed villages cascade down scrabbled slopes. And there's no better way to explore them than aboard an authentic tall ship with the knowledgeable guides marked by this Lindblad Expeditions charter. 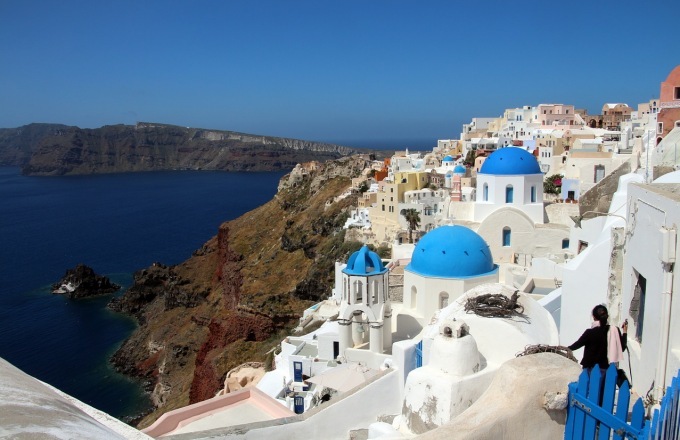 The Cyclades are the essence of the Greek Isles. They surround the sacred sanctuary of Delos, one of the most important archaeological sites in the western world. Many of the Cyclades remain virtually unknown to all but the Greeks and the discerning traveler. Your expedition in the Cyclades is an organized mosaic of highlighted island jewels, profound historic substance, overlooked day-by-day living, the sensual delight of Mediterranean flavor, flora, color, sea and sails hoisted above the legendary Sea Cloud: Lindblad. This windjammer will inspire you. Her maritime character as a graceful private yacht will create an atmosphere of elegance while sailing the storied Aegean Sea. It’s the perfect way to experience the islands that the gods called home. Depart on an overnight flight to Athens. After some time at leisure and lunch in Athens, travel to Piraeus and settle into your cabin on the majestic Sea Cloud: Lindblad. Cast off this afternoon, and take in your first Grecian sunset at sea. Your first morning on board is spent at sea. You may stop for a late-morning swim before visiting the island of Sífnos. Distinguished for its pottery and its Venetian dovecotes, Sífnos is a rugged island with a harbor village and a beautiful upper chora (village), waterfront tavernas and convenient beaches. It’s a great island for walkers or loungers alike. This afternoon, find a spot on deck to watch as the Sea Cloud’s sails are hoisted up their impressive masts by hand as you set sail for the Cyclades. Drop anchor at beautiful Tenos, dotted with villages steeped in Venetian history. The island’s Venetian-era dovecotes, terraced hillsides, and green marble quarries have long made this a haven for artists. Explore the picturesque village of Pyrgos, adorned with carved marble facades, and visit the church of Panagia Evangelistria, where thousands of pilgrims come every year to pray at Greece’s holiest shrine. The tiny archaeological gem of Delos is the birthplace of the twin gods Artemis, goddess of animals and the hunt, and Apollo, god of healing, music and light. Spend the morning discovering the island’s incredible ruins, including the Terrace of the Lions and the exquisite Temple of Apollo. This afternoon, look to make an impromptu stop at one of the many interesting islands in the area. Drop anchor at Amorgós, the easternmost isle of the Cyclades. Visit the main city, perched in the mountains, and see its beautiful domed churches and windmills. Explore the dazzling white monastery of Panagia Hozoviotissa, clinging to a cliff face above the sea. Later, return to the Sea Cloud: Lindblad and enjoy a relaxing afternoon beneath its splendid sails. Incomparable Santoríni is an island archipelago formed from a single volcanic cone that erupted in the second millennium B.C., burying the island's Minoan culture in ash. Sail into the caldera, and drive through windswept vineyards to the beautiful town of Oía, which affords unrivaled views of the caldera below. After lunch, ride a donkey or a cable car down the cliff side back to the ship. Enjoy a glorious day of sailing among the evocative isles of the Cyclades. Relax on deck with a book, observe the crew as they man the rigging and trim the sails, and attend presentations by Lindblad's team of experts on the area’s history and ecology. In the late afternoon, you may have a chance for an impromptu stop and a swim. Day 9: Disembark Piraeus to Athens & U.S.
Disembark Sea Cloud: Lindblad this morning for transfers to the Athens airport for your return flight. The 58-guest Sea Cloud: Lindblad is the historic Marjorie Merriweather Post sailing yacht Sea Cloud, chartered by Lindblad Expeditions for select Mediterranean itineraries. Far more than a voyage along the coasts and among the islands of Homer's wine-dark sea, a sailing journey aboard the 360-foot Sea Cloud is a chance to experience these lands and waterways as the ancients did. Sail into ports with ruins where the seeds of democracy were sown and titans of the era from Plato to Alexander the Great held court. Category 1 cabins have two single beds, a panorama window and showers. 113 square feet. Upper and lower single beds, private bath and a porthole. These cabins once housed the ship’s officers. 102-108 square feet. Located on the Main Deck, these large cabins, originally occupied by guests (and the nannies, #9-10) of the owner, have a mix of bed types and decorative motifs. All have portholes and private baths with bathtubs. 194-215 square feet. These incomparable suites were occupied by Marjorie Merriweather Post (#1) and E.F. Hutton (#2). They have king-size beds, portholes, marble fireplaces, walk-in closet, generous sitting areas and grand marble bathrooms with bathtubs and golden fixture. 366-410 square feet. Discover the natural and historical treasures of the Ionian, Croatia, Albania and Montenegro on this 8-day cruise aboard the 49-guest Panorama. On this 8-day Mediterranean cruise, discover the treasures of Ancient Greece, such as the Amphitheater of Epidaurus, the ruins of Agamemnon's Royal palace and ancient tombs at Mycenae, Ancient Olympia, birth place of the Olympic Games and the spectacular Oracle Temple of Delphi. The Croatia Island Hopper cruise is an unforgettable small ship exploration of the southern Adriatic Sea along Croatia's Dalmatian Coast. Cruise among islands, beaches and ancient medieval towns aboard the deluxe 38 guest small ship Futura, avoiding big ship ports and crowds. Spend your days relaxing on spacious decks, swimming in the Adriatic Sea and exploring Croatia's most beautiful destinations. A Croatia small ship cruise is the ultimate up close exploration. The client must obtain and have possession of a valid passport, all visas, permits and certificates, and vaccination certificates, required for the entire tour. The client accepts responsibility for obtaining these documents and any other necessary documents. It is the client’s responsibility to assure that the name on your airline ticket, cruise tickets, or any other travel documents matches your name as printed in your passport (or domestic identification, where applicable) by providing the exact name as it appears on your passport (or domestic identification, where applicable) to Adventure Smith Explorations before tickets are issued. Once we have received your deposit and all signed Traveller Information Forms, we will send you a comprehensive Adventure Planner dossier. This contains our exclusive Adventure Smith Explorations destination handbook, map, immunization information, visa and permit information, a travel insurance application, packing list, reading list, etc. You will also receive a final tour packet (which may be provided electronically) including final reminders and local contact information for your destination, and, where applicable, tickets and vouchers, 2-3 weeks prior to the Trip Start Date. Information or advice given by Adventure Smith Explorations on visas, vaccinations, climate, clothing, baggage, special equipment, etc. is provided as an aid to you but Adventure Smith Explorations does not warrant or guarantee the accuracy or applicability of this information. You are responsible for confirming the applicability and accuracy of all such information necessary for your travel.